Tucked into every rolling Tuscan hill and behind every gate and barred window along the sundrenched streets of each small town are hidden treasures that lie concealed. For one day only, ADSI is celebrating springtime by unlocking the doors for their Open Courtyards and Gardens event on Sunday, May 21. Thanks to the Association of Historic Italian Dwellings (A.D.S.I. ), which places a special emphasis on maintaining national identity and cultural legacy, over 90 historic homes, monumental parks, gardens, and courtyards will be accessible from 10 am – 1 pm and 3 – 7 pm. 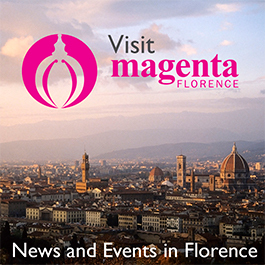 This year, new estates will be on view in Mugello, Pontremoli, Lunigiana, Crete Senesi, Val D’Orcia and Casentino. During the day of the event there will be guided tours, and even a photo contest on Instagram, where the winning snaps will be shared at the Photolux Festival in November 2017. Admission to each castle, courtyard, and garden is free. Tours are offered in varying locations for €5. Highlights include the beautiful and romantic Castello del Trebbio on via Santa Brigida in the Mugello. Constructed in 1184 by the noble Florentine banking family the Pazzi, the castle is where the infamous “Pazzi Conspiracy” – the attempted murder of Florentine ruler Lorenzo de’ Medici – was planned. In nearby Borgo San Lorenzo the Villa di Striano, a popular wedding venue, will also welcome visitors. Lucca’s historic center boasts two gorgeous gardens; the Giardino Elisa, named for Elisa Baciocchi, designated by her brother Napoleon as the area’s ruler for 10 years, and Giardino di Villa Orlando, via Giacomo Puccini, 252. The hidden gardens of Lucca tour will start at 10 am and 3:30 pm, meeting at the Info Point of Porta Elisa. In Lunigiana, the splendid gardens of Villa La Pescigola will be accessible and a special Butterfly Walk will be offered at the Parco della Villa Ruschi di Tegalia and the Giardino di Palazzo Negri Dosi. Closer to the coast, the Giardino Venerosi Pesciolini on via della Chiesa, 4 in Pisa and the grand Castello della Gherardesca on via Indipendenza, 1 in Livorno will be showing off the impressive statuaries and flower beds. Further down south in Crete Senesi is the remodeled Castello di San Fabiano, via di San Martino 1000A. Now a bed & breakfast, the Castello still maintains its lovely gardens alongside a pool. During Open Courtyards and Gardens, the venue will host an artisan fair. Three gorgeous castles in the Casentino valley of Arezzo show off the ancient Etruscan and Roman history that is sprinkled all throughout the region. The Castello di Porciano is an early Renaissance castle that was inherited by Italian noblewoman Flaminia Goretti and was restored by her and her husband, American soldier George Anderson Specht, after WWII. Castello dei Conti Guidi, or Poppi Castle, was the venue of the surrender of the Conti Guidi family and the Milanese forces, confirming a victory for the Republic of Florence and Italian League in the Battle of Anghiari. 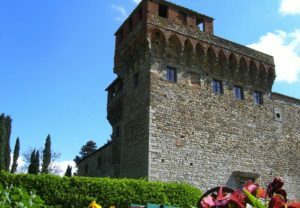 Also on view is the Castello di Valenzano, originally a watchtower during the late period of Lombard rule in Tuscany.